Data from the Very Large Telescope (VLT) in Chile to analyze the light from distant quasars shows that hat one of the constants of nature appears to be different in different parts of the cosmos supports the theory that our solar system is an area of the universe that is "just right" for life, which negates Einstein's equivalence principle, which states that the laws of physics are the same everywhere. "This finding was a real surprise to everyone," says John Webb of the University of New South Wales in Sydney, Australia. Webb is lead author on the new paper, which has been submitted to Physical Review Letters. The report describes how the "magic number" known as the fine-structure constant – dubbed alpha for short – appears to vary throughout the universe, says the team from the University of New South Wales, Swinburne University of Technology and the University of Cambridge. The work is currently under peer review. “The implications for our current understanding of science are profound. If the laws of physics turn out to be merely “local by-laws”, it might be that whilst our observable part of the universe favours the existence of life and human beings, other far more distant regions may exist where different laws preclude the formation of life, at least as we know it. The core finding of the new study is the fine structure constant, also known as alpha. This number determines the strength of interactions between light and matter. A decade ago, Webb used observations from the Keck telescope in Hawaii to analyse the light from distant galaxies called quasars. 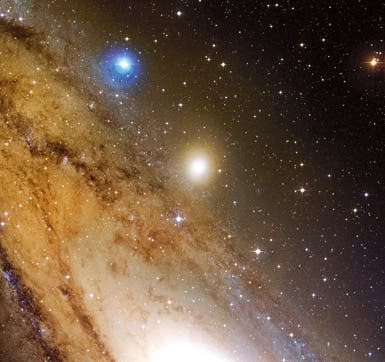 The data suggested that the value of alpha was very slightly smaller when the quasar light was emitted 12 billion years ago than it appears in laboratories on Earth today. Now Webb's colleague Julian King, also of the University of New South Wales, has analysed data from the Very Large Telescope (VLT) in Chile, which looks at a different region of the sky. The VLT data suggests that the value of alpha elsewhere in the universe is very slightly bigger than on Earth. The difference in both cases is around a millionth of the value alpha has in our region of space, and suggests that alpha varies in space rather than time. "I'd quietly hoped we'd simply find the same thing that Keck found," King says. "This was a real shock." King says that after combining the two sets of measurements, the new result "struck" them: "The Keck telescopes and the VLT are in different hemispheres; they look in different directions through the universe. Looking to the north with Keck we see, on average, a smaller alpha in distant galaxies, but when looking south with the VLT we see a larger alpha. "It varies by only a tiny amount – about one part in 100,000 – over most of the observable universe, but it's possible that much larger variations could occur beyond our observable horizon." Co-author Dr Michael Murphy, of Swinburne University of Technology, says the discovery will force scientists to rethink their understanding of Nature's laws. "The fine structure constant, and other fundamental constants, are absolutely central to our current theory of physics. If they really do vary, we'll need a better, deeper theory," Dr Murphy says. While a "varying constant" would shake our understanding of the world around us, Dr Murphy notes: "Extraordinary claims require extraordinary evidence. What we're finding is extraordinary, no doubt about that. "It's one of the biggest questions of modern science – are the laws of physics the same everywhere in the universe and throughout its entire history? We're determined to answer this burning question one way or the other." If the interpretation of the light is correct, it is "a huge deal", agrees Craig Hogan, head of the Fermilab Center for Particle Astrophysics in Batavia, Illinois. But like Cowie, he told New Scientist that he suspects there is an error somewhere in the analysis. "I think the result is not real," he says. Michael Murphy of Swinburne University in Australia, a co-author of the paper, says that the evidence for changing constants is piling up. "We just report what we find, and no one has been able to explain away these results in a decade of trying," Murphy told New Scientist. "The fundamental constants being constant is an assumption. We're here to test physics, not to assume it."